Another high-profile industry award for Towcester-based Sandwell has further highlighted the specialist high-tech skills within the surrounding Silverstone Technology Cluster. Sandwell Founder and Technical Director Colin McGrory recently collected Shot Peener Magazine’s ‘Shot Peener of the Year’ award for 2016. He becomes one of only three Britons to have ever won the award. “It is our pleasure to award Colin McGrory the Shot Peener of the year Award,” commented Jack Champaigne, editor of the Shot Peener magazine and chair of the SAE Committee for Surface Enhancement. The UK is recognised as a leader in innovation and research and Sandwell is a key contributor in its field of expertise. 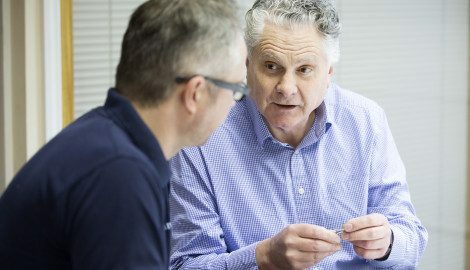 As a company it continues to develop processes and techniques by engaging with partners and technical experts to ensure its processes align with advanced manufacturing techniques. Sandwell’s story formed part of the research commissioned by Silverstone Park developer MEPC and partners PwC and Barclays that led in summer 2016 to the publication of a report that identified the existence of the Silverstone Technology Cluster. This is the region within an hour’s radius of Silverstone that is home to an exceptionally high concentration of companies (approximately 4000) which are at the forefront of advanced engineering and manufacturing. A new company, STC, has since been formed to lead promotion and awareness of the Cluster which has quickly received support from both Government and the business and finance community. CLICK HERE to visit its website.